At Duke, we bring curriculum to life for our students to help make connections between theory, practice and improving care for those we serve. In one of our ABSN courses, Gerontological Nursing—Caring for Older Adults and their Families, students learn about caring for an aging population and helping patients’ caregivers. Faculty employ three unique approaches to engage the minds and hearts of our students as they learn to care for vulnerable elders and their families. The first, practical application, includes training from the Duke Elder Family Caregiver Training Center. The second, experiential learning, is taught with real-life role-playing and simulations for dementia and Alzheimer’s patients. The third, and arguably the most unique, is creative and artistic expression and explanation, allowing caregivers and patients to find common grounds for communication. As the baby boomer generation ages into their 70s and 80s, more of nursing’s charge will include geontological care. This shift will affect nearly all aspects of nursing from patient interaction to training home caregivers on how to help their loved ones who are suffering from age-related ailments such as dementia. In a unique intraprofessional partnership, Duke ABSN faculty collaborated with the Duke Elder Family Caregiver Training Center (DEFT) to teach students how to train caregivers of elderly patients once they leave the hospital. The DEFT Center, directed by Cristina Hendrix, PhD, RN, FAAN, prepares and empowers individuals in their role as caregivers of homebound older adults especially during challenging transitions. The DEFT Center funded by a $1.5 million, three-year grant from the Duke Endowment. The Center provides an academic-medical-community model for assisting caregivers following hospital discharge, and is entering its third year of service. The training students receive from DEFT helps prevent hospital readmissions and/or stays in assisted living centers. It also gives students real-world insight toward elder care and caregiver training. 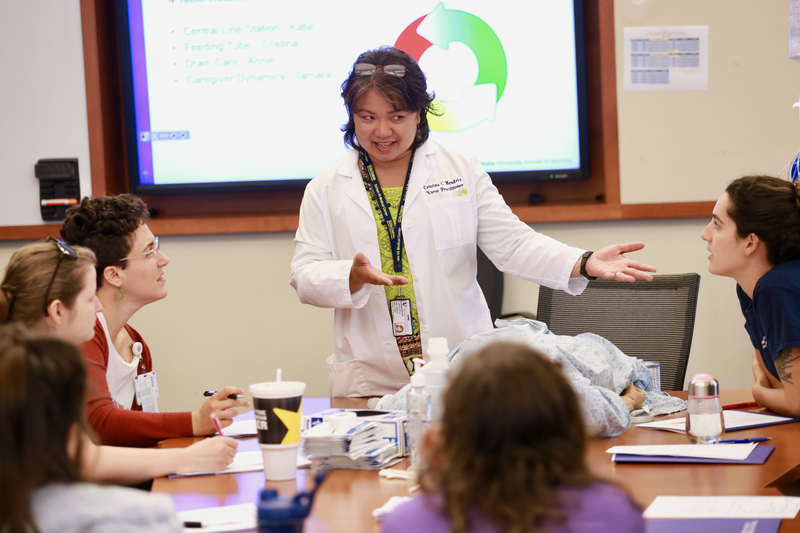 Another way ABSN faculty is bringing gerontology curriculum to life is through highlighting how Duke nurses become leaders in their fields. Bunn’s teaching is part of a team-based approach that includes family members and other informal care partners to provide better care to their loved ones. Also part of the Gerontological Nursing—Caring for Older Adults and their Families course, students take part in the Reflections Program at the Nasher Museum of Art. This program allows people who have dementia and their caregivers to experience art with free discussion and without time constraints. 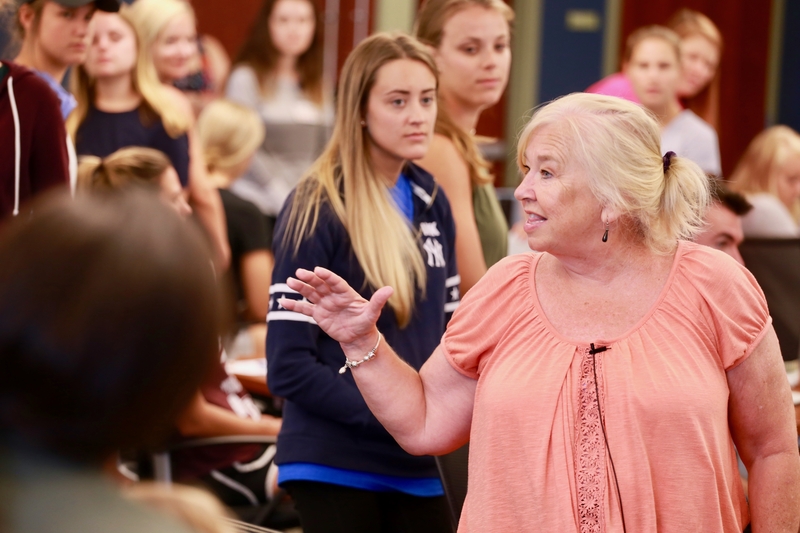 “Through the Reflections Program, students are learning a different approach to working with patients with problems such as dementia and Alzheimer’s disease,” says Deirdre Thornlow, PhD, RN, CPHQ, assistant professor. Studies have shown that art can boost cognitive function and now it may provide future nurses with a non-judgmental, creative way to relate to patients. The program provides students with ideas for how to interact with patients who are experiencing age-related decline and the Museum’s art provides a subject matter for them to interact. Providing opportunities such as DEFT training, sessions with leaders in gerontology and the Reflections Program, the ABSN program develops critical thinking and engagement skills that prepare our students not only for being nurses today, but becoming nursing’s leaders tomorrow.